The explanation of the blue bead code differs according to the doctrine and the religion as some "Sunni Muslims" believe that it refers to the five pillars of Islam, while some Shiites believe that it refers to the five persons of cover "May god peace be upon them and bless them" (Muhammad, Ali, Fatma, Hassan, Hussein) , However Jews believe that it refers to the five books of "Torah" (The books of the prophet Moses), but the archaeologists have another opinion as they believe that the common root of all those beliefs in both religions back to the roots of the "Phoenicians" as they were worshipping "Tanit" the guardian moon goddess in the kingdom of "Carthage" with that icon as the circle in the palm of the hand middle symbolizes the moon. 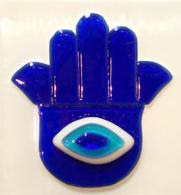 It is believed that the Semitic peoples who have inhabited the parties of the mediterranean sea are drawn the palm of the hand which carrying the blue eye in order to intimidate the Romans who colonized their countries in an era of history, and perhaps the blue eyes are the hallmark which distinguished the Romans of the colonized peoples at that time, as it was a clear expression of their rejection to the new colonists so they were carrying a stick with that frightening symbol in above which threatening to uproot their eyes (The Romans eyes) or they were only fixing it on their doors, and later become a symbol of protection against evil, and they bear in their necks as laces, or they hang it on the walls of their houses. Some believe that myth has a relevant to the rituals of magic which give every number a meaningful characteristics and semantics, and according to this belief number 5 and the palm of the hand have energy vibrations of defense which prevent the human bodies or their own things from harm if it paid in the face of an envious . In some Arab societies, women show her palm in front in the face of whom they think that he/she conceals envy to them while they pronounce the number "five" and its multiples or any words related to it as they say:"Today is the Thursday , the fifth day of the month". In recent years, a number of peace movement activists from the Jews chose to wear the badge of a blue bead as a symbol of common heritage shared among Muslims and Jews in the context of their call for coexistence between the Jewish and the Palestinian peoples.